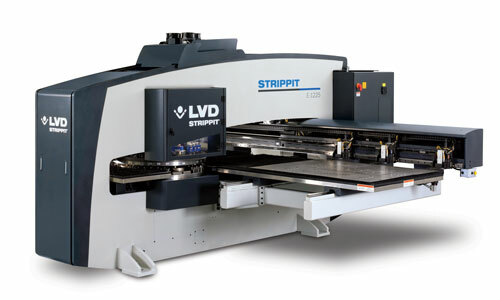 LVD Strippit introduced its new Strippit E Series servo-electric punch press, offering high energy efficiency and exceptional accuracy for punching and forming applications. The machine delivers 20 metric tons of punching capacity and handles worksheets to 49.2 by 98.4 in. A larger model, Strippit E-1530, handles sheet sizes to 60 by 120 in. The electric drive’s streamlined design has fewer components than hydraulic punching machines and fewer parts than most comparable electric punch presses, keeping operation and maintenance costs low while ensuring reliable performance and high uptime. The drive also makes the Strippit E punch press quiet to operate. A 47-station turret provides a mix of stations that accept shaped punches and dies, indexable multi-tool, tapping, and wheel tools. A full 0.984-in. feed clearance between the upper and lower turret allows for higher forms such as lances, louvers, embossments or card guides. Precise programmable ram control produces accurate results for forming operations.